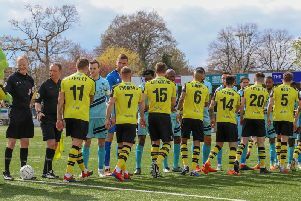 Jack Emmett is confident Harrogate Town’s record breaking campaign can spur the club on to greater heights, writes Hal Boxhall-Dockree. The local winger set up Dominic Knowles’ leveller at Kellamergh Park to keep the two legged tie alive, but could not help Town find the elusive goal to force extra-time. Although the season ended in disappointment for the team he used to watch as a boy, Emmett already has his eye on bigger prizes next season. He said: “This season has been a special season. We have got a really good bunch of lads and some unbelievable players. It’s a shame it had to finish this way. “Obviously there have been highs and lows this season, Simon Weaver has brought the new lads in and achieved our highest ever league finish. “The second half of the season we maybe could have done a little bit more and weren’t quite on top of our game, but Simon has brought together a really strong team here. “I grew up watching Town and was a ball boy when I was about eight years old so it’s incredible to be representing the club in the play-offs. “I think this season has given us belief we can do it and hopefully next season we can win the league instead of having to go through the play-offs. A 1-0 first leg defeat at the CNG made progression to the playoff final that bit harder, but Emmett, who was playing for amateur side Wetherby Athletic two years ago, insists his side always believed they could progress. The home performance prompted Weaver to make five changes to the side and shift the formation with Emmett deployed in a central role behind the two strikers; something the 2014/15 Supporters Player of the Year relished. He said: “We had worked on the formation a lot this week, the gaffer had seen it as a way to disrupt them.